This family friendly 3 star apartment is located in peaceful environment, surrounded with meadows and river. Completely renovated for season 2018. New and modern, better equipped with dishwasher, air condition. Smart tv is in each bedroom. Children playground is available and all equipment is free of charge. Look photos in our gallery and book your relaxing vacation in family friendly destination. In summer time guests can take vegatables and fruits for free of charge from our garden. We have small garden for ourselves. Fruits and vegetables we breed are pesticides free. Children can enjoy on trampoline, slide, badminton, darts, basketball or sand playground. Rent a bike to explore cycling routes arround or rent a kayak and feel pittoresque landscapes of Gacka river. Ask your host. We are always present at listing and we always serve welcome drink to our guests: coffe or tea and home made liquor (Sljivovic - made from plumbs). Always at your service, we can pick you up in city center or at bus station at arrival. If you are interested in history of this area we can inform you and show you some of the interesting natural or historical places. We love to spend some time with our guests to get know each other, but always respect your privacy and your wishes. Hi there, my name is Denis and I am the owner of the house and the apartment for rent. I was born here, finish primary school and school for economics in Otocac. After that I went other town to study tourism. Now I live with my wife Sandra and daughter Melani at the place where my grandfather and father were born. My wife Sandra is also from the area. Her home villege is only 10 km distance from here. we enjoy to work tourism. meeting people from all aver the world our small home becomes small world. Actually we didn't buy this property. My father and mother start to built our home in 1990 and later I finished it. Now I proudly live with my family in the home that my father and mother start to built. Children playground is advantage for parents with children. We also provide kayak, bike, and ATV tours for adventuourists and nature lovers. Porch with BBQ place is great for party people. We provide fun for everybody. Fully equiped bathroom with hairdray, towels, soap and toilet paper provided. Small village with low traffic. 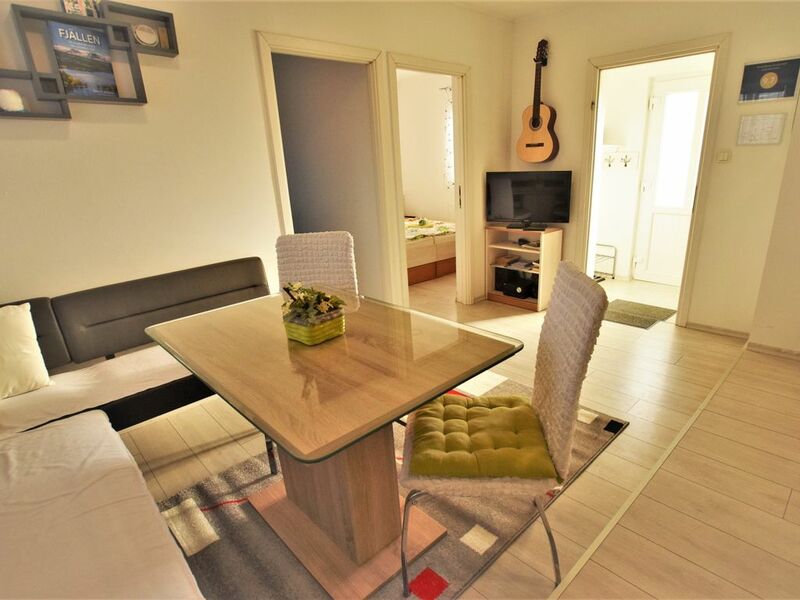 Apartment is only 50 metres distance from Gacka river. Garage is available on demand. Wi Fi internet is free of charge. Password is provided at the spot. There is some fitness equipment availble in the apartment. Ask your host for details. Stayed in Denis’ apartment for two nights and absolutely loved it. The apartment is fully stocked and generally just beautiful. Denis and his family could not be more welcoming and hospitable, Denis even picked up an iPhone cable for me when mine broke and all the shops were closed in town. Easy drive to Plitvice Lakes and 3 supermarkets all very close by. Could not recommend this apartment more. Absolutely amazing. Our stay here couldn't have been better. Denis was very helpful and friendly. The apartment was very comfortable and had everything we needed. We hope to come back again someday. My husband, myself and our 2 little boys stayed in this apartment for 2 nights. The apartment itself is very basic and nothing fancy, but it's comfortable and cozy. It has a pellet stove if the evenings get cold and the small kitchen is well stocked. The yard has a sandbox, toys and a trampoline for little kids. The best part about staying here were the incredible hosts. Denis and his wife Sandra are so helpful and willing to make your trip special. They own a tourist business which rents kayaks, bikes and ATVs. We were able to explore the river on Denis' kayaks, and the surrounding area By bike. Denis and Sandra helped to make our trip very memorable and staying with them was a highlight of our trip to Croatia. We did not miss anything and Denis answered all our questions. The apartment was heated and very clean when we arrived. The place is very calm. We will know where to live if we come back! Gut ausgestattete Ferienwohnung mit 2 kleinen Schlafzimmern - die für 4 Personen und einen längeren Aufenthalt wenig Platz für Wäsche bieten. Wir hatten nur 2 Nächte und waren sehr zufrieden über die Sauberkeit, die großzügige Küche mit Esstisch, die Ruhe und den freundlichen Vermieter. Très bel endroit, très confortable, propre, avec plein de facilités. Possibilité de louer des kayak sur place - hôte très accueillant - nous ne pouvions pas espérer mieux! Très bons petits restaurants locaux tout prêt. Encore un grand merci à vous et votre famille, Denis ! If you decide to visit our place, please be aware that you will need at least 3 days to fully experince area and adventures.